Cooling + Heat Pump system tune-up special price is $79.00 and includes up to 1.5 hours labor (parts and/or refrigerant extra if necessary). 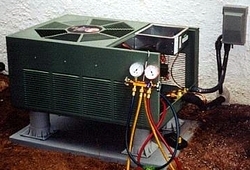 Cooling and heat pump repairs are $60.00/hour during normal business hours. 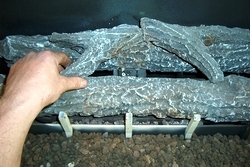 Oil-fired heating equipment needs an annual tune-up to maximize your heating dollar. A tune-up can actually reduce the amount of oil you consume and increase the overall efficiency. Oil-fired heating equipment tune-up special price is $189.00 and INCLUDES up to three(3) hours labor and (1) nozzle, (1) oil filter and (1) oil pump gasket. 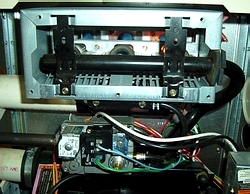 Oil-fired equipment repairs are $60.00/hour during normal business hours. Gas-fired heating equipment is not as maintenance intensive as oil but requires an occasional tune-up to ensure maximum efficiency and the safety of the appliance. Gas-fired heating equipment tune-up and repair is charged out at the regular service rate of $60.00/hour during normal business hours. Oil and Gas systems get an efficiency test upon completion of the tune-up or service call. 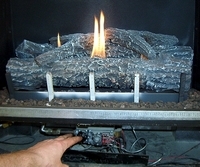 Gaslogs, gas fireplaces, gas stoves and heaters sometimes need a tune-up. Maybe the flames don't look right or there is some sooting of the logs. Perhaps the flames go on/off intermittently or won't light up at all. In these instances, a service call would be a good thing. A programmable thermostat can be installed in your home to save you money. While you are sleeping and at work, the thermostat automatically scales back your indoor temperature during these "unoccupied" times. Before you wake up in the morning or arrive back home from work, the thermostat brings the temperature back to the original "occupied" temperature. I recommend these thermostats to people who have gas or oil systems in their homes with or without air conditioning. Installed from $60.00/up. Humidifiers installed on gas or oil warm air furnaces and heat pumps keep indoor air more comfortable in the winter by adding moisture to the circulated air in your home. Dry air can create health problems, or make existing problems like allergies, skin conditions and respiratory ailments worse. 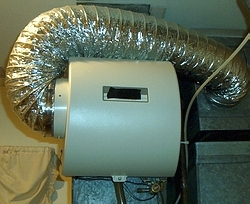 Dry nasal passages, coughing and sore throats can be helped by a furnace mounted humidifier. Also, dried-out furniture, peeling wallpaper and static electricity can be reduced or eliminated by introducing moisture into the dry winter home! Ultraviolet (UV) lights can also be installed in ductwork to kill airborne and surface microorganisms like fungi, mold, and bacteria and eliminate the odors associated with them. These lights can be installed in the main supply and return ducts of your heating/air conditioning system.